Last Chance - Limited Quantity - Only 6 left! All tattoo ingredients are safe, cosmetic grade, and intended for external use only. Discontinue use if skin becomes irritated. First, clean your skin with soap and water, or alcohol. Apply tattoo to an area that is relatively free of hair, and away from eyes or extra sensitive skin. Cut out your choice of tattoo, leaving a margin of white around the tattoo. Remove the clear plastic film covering and place the tattoo face down on your clean, dry skin. Wet the back of the tattoo thoroughly using a damp cloth or sponge, and apply firm, even pressure for 15 to 30 seconds. Carefully remove the paper backing. If necessary, smooth out the tattoo using a damp cloth or sponge. Wipe with alcohol, baby oil, or lotion, or use the sticky side of adhesive tape to pull off the tattoo. 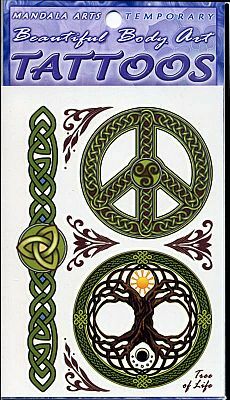 Do you have any other questions about our Tree of Life Temporary Tattoos? Your shops items are absolutely devine. Just what I've been searching for and now here it is. Everthing happens for a purpose when it is time to.